What a gorgeous color combination! The buds of this Bicolor Butterfly Bush start out a deep purple and open to a soft pink. As each flower ages it turns to a peachy orange. This plant is sometimes available in plug trays. These trays hold 128 of all the same plant. They are a great low cost way to fill a lot of space. Each cell is 3/4 of inch by an inch. 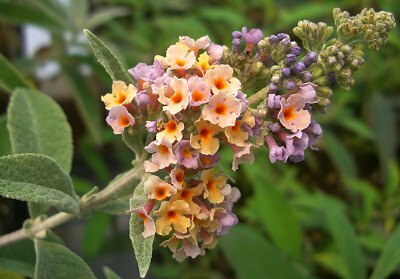 Check here to see if Bicolor Butterfly Bush Plug Trays are available. Bicolor Butterfly Bush makes a great addition to our Wildlife Herb Garden Six Pack and to our Zone 5-11 or Zone 8-11 Fragrant Herb Garden Six Packs.